Given there are only 27 sleeps until Spring has officially sprung, it is a somewhat belated realisation that I may just well own a beret-wearing gene. I’m knitting Brooklyn Tweed’s delicious Porom pattern and I. Just. Can’t. Stop. It’s a crafty addiction worse than anything to date. I have crossed a line. The creative space follows me everywhere – so much so that I have my kids on Traffic Light Duty. I can generally squeeze in a few pattern repeats before three anklebiters scream GREEEEEEEEN! GO! GO! GO! in my ear. None of that amber-warning, easing-into-things malarkey for them. The thumping headache is coming along nicely thanks, but so is my new-to-me fashion statement. PS. Jared Flood of Brooklyn Tweed is a (gasp!) male (gasp!) knitter/designer who owns a blog oozing woolly style. You can access his patterns via Ravelry. Yup, that's the sign of a true addiction. Some day your children will reminisce on the days of light monitoring while Mom knitted away! Holy Cow I am jealous lol I can barely keep a handle on knitting needles sitting on the couch lol..
And thanks for the insight into just HOW you get so much done. Once you start, you can' stop...I think I will now be goign to sleep to the Pringle jingle. So they advise on the work rhythm , but you get to wear the finished product . What's in it for them ? Apart from a mother with a warm head and Style . P.S. Orange and fish finger smoothie ? Now , that's silly . I totally get that all consuming craft addiction thing. My only problem is that there are no traffic lights in Daylesford. 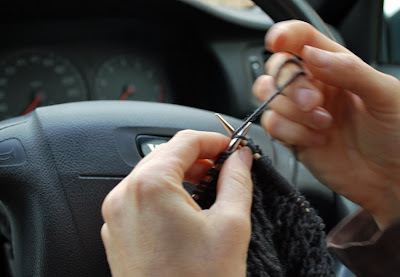 Put it this way, if I could take my sewing machine into the car and sew at the lights, I would. You are not alone in the obsession department! Can't wait to see the final results - MODELLED too please! A newly discovered gene... wowza. That's a bit scary. I wonder what others you've got hiding away in there!! Although if they are as glamourous as beret-wearing, there should be some fun times ahead. PS. I don't for pnce believe you were being humourous about the red light thing. I think you are telling the truth! brilliant - put those small to good use! I'm all for it! But now just teach them to watch the orange on the other lights so you can really start testing your speed .. orange ... red... it's coming ...green GO GO GO! I can now understand the appeal of knitting, you really can take it everywhere! I've made a mental note that you have knitted the vest I'm attempting, beware the novice knitter! I keep looking at all those gorgeous patterns on ravelry and imagine much knitting ahead of me (if I can just get through this vest). Oh the beret will be lovely when its all finished, which woun't be long by the sound of it! i carry my camera everywhere...scissors...fabric...oh no! Smitonius says: I love Brooklyn Tweed's knits.... look forward to seeing your FO! That's dedication. I'm not quite keen enough for red light craft. Haha! I used to do that with books... but I fear it may be a little more dangerous with sharp implements at the wheel! And when you're on to a good creative spark, you go girl! Love it. I'll be watching out for you on the road missy. Dangerous!!!! Love Brooklyn Tweed. Thanks for the link. Now, quick, back to my granny rug. Spring is coming. ... but are you knitting on the toilet I ask? What a classic! I'll be looking out for you too! can't wait to see it. that is if your ALIVE to finish it! haha. It is always reassuring to know that there is someone even more obsessed with knitting than me. It raises the question though, where else are you doing it?